The first Del Taco opened in 1961, one year before the other guys. Although both began in California, only one of them made it all the way to my home state of Michigan. As a teen, I spent a lot of expendable income mowing down cheap tacos. But many years later, I finally made my way to California where I was introduced to the fast food delight known as Del Taco. What makes Del Taco different? 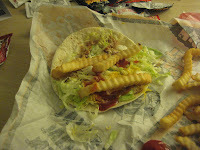 In a California, drive-thru, fast-food culture based around burgers and tacos, Del Taco offers both on the same menu. Not enough to entice you? The menu also offers french fries, chili, breakfast and cake…yes CAKE! With nearly every visit to the LA area since 1996, I have made a stop at Del Taco. It’s utterly fantastic fast food with American and authentic Mexican food items as well. And let’s be honest, french fries with tacos? That is like peanut butter and jelly, beer and hot wings, ice cream and hot fudge, pork chops and apple sauce…OK maybe not that last one. But seriously, hot crinkle cut fries and tacos…it’s a match made in fast food heaven. Get some, put them in your taco and enjoy the love. I have seen menu items come and go, the addition of Del Inferno Sauce, the sale to Sagittarius Brands and more. But the one thing I have NEVER done? Eaten the Del Taco burger. Del Taco is good all times of the day but it’s especially tasty when one has sampled a few adult beverages. 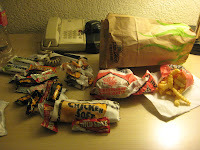 With a few bubbling around in my belly, I got me the craving for Del Taco. The order, 1 chicken soft taco, small fries and a cheese burger. The burger is made of 100% pure beef, served on a sesame seed bun with cheese, pickles and ketchup. Not a fan of the last two condiments, I ordered without. With much pressure to live up to my own personal hype, I took a bite of the burger. 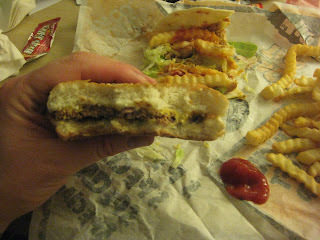 While the bun was fresh, it was too much or perhaps the patty was too little as the bun to beef ratio was off. The cheese was your standard American cheese product of which I am a big fan. It’s salty, greasy, fatty and it’s bad for you but it tastes so good. The patty itself was small, overly salted and dry. While I hoped for some kind of burger victory, it just couldn’t live up to the tacos. Now before you go get all turned off, realize that I mean no harm in this post. I love Del Taco for their tacos, burritos, french fries and especially their breakfast menu items. I just wouldn’t rank the burger on a must get basis but saying that, you must get everything else! Be a real fatso and line your tacos or burritos with fries. Skip the ketchup and be sure to lather on a packet or two of the Del Scorcho or the hotter Del Inferno . For fast food hot sauce, it’s the best. In fact, I usually snag a whole handful of packets and take them home for adorning other food times. Although there are now 6 locations in Michigan, I now live in NYC and am praying for the day they open a Del Taco here. 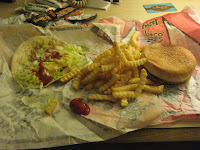 Click here to sign the official Burger Conquest petition to bring Del Taco to the East coast. 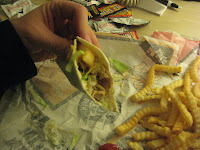 SIGN THE PETITION TO BRING DEL TACO TO THE EAST COAST! 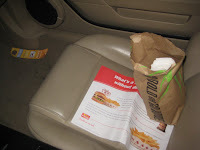 This entry was posted in Burgers, California, Fast Food, Los Angeles and tagged bar, best burger, burger blog, burger club, burger conquest, california, cheese, ciancio, david, del taco, drive thru, fast food, french fries, gourmet burger, great burger, hamburger, los angeles, restaurant, rev, review. Bookmark the permalink. haha that's awesome. damn you americans and your fast food options!